Just as a counter to the many stories and rumours about 40daysforlife which are being circulated as “truth”, it’s well worth reading Clare, a regular participant of the vigils, as well as what Laurence has to say on the vigils that have been taking place in Brighton. I was particularly struck by this comment, made on the Bloomsbury Pro-choice website earlier today, by a potential pro-choice supporter. 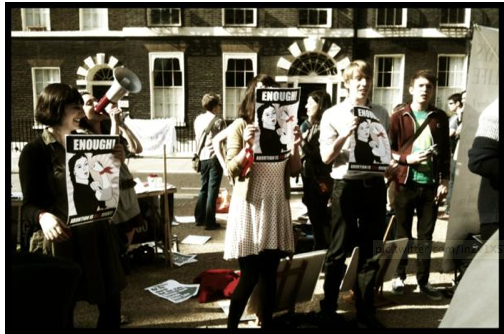 I was in attendance today at Bedford Square and I saw all of what occured, from the moment of the table-move onwards, and I have to say that I was utterly disgusted. Perhaps I honestly could have believed that 40DfL were intimidating women entering the clinics, perhaps I could have been sympathetic to tea, biscuits and balloons, or your arguments and literature – but honestly, every chance of that died today. The true face of the so-called ‘pro-choice’ movement was shown today – not in the cozy strumming of guitars or sun-bathing, but in the direct aggression and intimidation employed against those praying with 40DfL. You can both have quiet protests in corners, or even loud ones, but to move camps deliberately to (as you correctly state) a metre from the opposing protest is a terrifying move to make – one that has lost you both supporters and potential allies today. What possible good motive can there have been to shift tables and demonstrators to right infront of another demonstration? Imagine if Bobby Copper had been there, and seen you shifting selves and equipment in what could be construed as direct provocation. By blocking their signs you denied their right to protest. What would that same policeman say, if he then saw you turning a megaphone towards to face those you criticise for intimidation, and to all chant at only a few feet from them all sorts of attacks? All this while you filmed them, some so close that the cameras practically touched them. Then members of your counter-demonstration danced around mockingly pretending to be Jesus on the cross, as per Monty Python, or mocked the religion of those attending saying “You’re talking to an imaginary friend!” and “No one can hear you!” among other things. THAT is intimidation – a few Catholics praying is something of an entirely different order. You were here for most all of this – you did not put a stop to it, even though it was beneath your banner (and that of the Socialist Worker). If you can still, after what occured today, invite everyone who partook of it back for Friday’s demo, refer to them as awesome and give only the slightest apology (not merely grudging, but at every point self-justifying through comparison with 40DfL’s entirely less threatening activities) then I can have no respect for you or your group. I have little doubt that you will have done nothing today but have strengthened the resolved of the pro-lifers, and made sure that as many as possible attend to oppose your vicious tactics on Friday. The mockery of their religion, the shouting in their faces, and the deliberate occupation of the same corner can only be used by them as a propaganda coup. What does it matter how many numbers turn up on Friday, when those whom you bring on Sundays act like that? As Louise Allain, noted on Twitter earlier, it seems to be those bearing witness and holding others in prayer, who are the most vulnerable. They certainly seem to be getting an inordinate amount of abuse. I’ve found it really hard to keep up with The Guardian over the weekend, which has become the paper of pro-choice propaganda. No sooner did one misleading, dishonest and factually incorrect article appear, ready for fisking, then another pitched up. I’ve counted at least six on this subject since Friday. The general theme seems to run along the lines of “we’ve been caught breaking the law, therefore the law is wrong and needs to be changed, abortion isn’t a medical procedure, women have a right to it without any medical consent, gender selective abortion doesn’t happen anyway and even if does then it doesn’t really matter, any clinics found to be breaking the law are being harassed by the government and media and it’s all the fault of 40days and SPUC and LIFE, who need to be stopped from giving pro-life presentations to schools in case it deters people from having abortions because we all know that abortion is such a wonderful thing, in fact we need more of it”. As I’ve said before, these guys are plainly rattled and are throwing as much mud as they possibly can in the hope that some of it will stick. Attack is always the best form of defence and those in favour of abortion are definitely on the defensive. 40daysforlife is a quiet prayer vigil, but is being painted as something altogether different and sinister, in order that a perceived threat can be seen to be addressed. The only threat the abortion clinics face is prosecution in the face of breaking the law and a sea-change in public opinion. Which is why they are doing their best to discredit by any means possible. It’s all getting very interesting and potentially very very dirty indeed. I’ll end with a few comments from an “angry feminists” timeline. I think that tells us all we need to know. I’m bleeding – according to their bible I’m unclean – can I go and rub myself up against them? Well we might have to if the wing nuts get their way! sick of “pro-life” fuckwittery. Can we drown them in amniotic fluid for the irony & lulz? How very peaceful and civilised. Abortion is a violent act – it can be no surprise that this violence is reflected in the rhetoric and tactics of those who wish to defend it. The irony is difficult to overestimate. The pro-choice argument is one based solely on willful ignorance of the violence that entails the destruction of new life. Oh the myth of the so-called tolerant peaceful pro-choicer. Once permitted and sanctioned by law abortion must be enforced in the most totalitarian way by the most brutal force and coersion. The same as you will see will happen with marriage – everyone who happens to find themselves on the other side of the curtain will be shouted down and marginalized. There will be no dissent allowed. What goes through the heads of these pro-death loons. My friend has just had an abortion. Her partner beat her black and blue. She was terrified to leave. When she fell pregnant she did what SHE thought was right. She did not want her child to suffer. It was her choice and hers alone. Some decisions are hard but no one should be told they are a murderer. I am so sorry to hear about your friend and her baby. I also agree that terms like murderer are extremely unhelpful, hurtful and display a lack of empathy and compassion, which is why, I would never respond to a woman in those terms. There is a difference between acknowledging that abortion constitutes the killing of an unborn child and describing a mother in such emotionally laden terms. Most women who do abort their unborn children don’t actually believe that they are taking a life, otherwise they would not undertake such an action, or even if they do, it is due to various pressures, society coerces women into thinking that abortion is just another “option”. I am sure that your friend did what she believed was the right thing, it is absolutely tragic that she believed that her unborn child was better off not existing as it would not be safe. Society needs to ask itself some very deep questions. It sounds like your friend didn’t feel that she had much of choice, which is even more tragic. The trouble is with writing is that it always sounds so cold and clinical, so I don’t think that there’s anything I can adequately say that could ease the pain of your friend, other than to assure her that her and her baby will be in my prayers. I was there yesterday and met some people who had been present on Sunday when the events your photo records took place. They said the anger and hatred exhibited, especially when they were praying the sorrowful mysteries, gave them a strong sense of what the crowd baying for Jesus’s crucifixion must have been like. (As an aside, I find that prayer, especially of the Rosary, arouses a quite irrational reaction in those who profess disbelief in God: if you don’t believe there is anyone there to hear it, why would prayer bother you?). While I was there, I saw nothing that could be possibly have been construed as aggressive, judgmental, challenging or intrusive. When I arrived, there were four of us, for a while there were only two and at the most there might have been half a dozen. We prayed the Rosary, the Stations of the Cross and a few litanies, had a few readings from Scripture: nothing more. I was there quite some time, and there was no sign of a policeman at any stage; this suggested to me that they don’t regard 40D4L as a serious threat to public order. On the other hand, there was clear evidence that eggs had been thrown at those praying before I arrived. No one seemed particularly fazed by this; on the contrary, the prayerful atmosphere was quite moving. It is common, but pointless, I think, to complain about media misrepresentation; nevertheless, the impression given by media reports of 40D4L is quite contrary to what I experienced yesterday. I am not in favour of abortion, but to accuse the pro choicers of “violence” is disingenuous and hypocritical, given the real violence and murder perpetrated against doctors and nurses at American clinics. This includes sending them parcels of White “anthrax” powder, as well as gunning down doctors. All of this creates an impression of pro lifers as murderous fanatics, which does nothing to assist a rational debate. Actually it is rather disingenuous to equate pro-lifers with violence, when it is precisely the violence of the act of abortion, to which we object. It is also more than a little unfair to equate the pro-life action in the UK with the actions of a few isolated and crazed individuals in the US. To put the figures in some sort of perspective for you, since Roe v Wade legalised abortion in the US in 1973, 8 abortionists have been killed and all of the perpetrators caught and punished. Since then an estimated 50 million babies have been legally killed via abortion. That equates to 1.2 million babies killed per year in the US versus two-tenths of an abortionist. And yet we are called violent? The killing of abortionists is abhorrent and unjustifiable. It is not a Christian act. But we need to remember that in the UK there has been no such history of violence by pro-lifers. Nor are our gun laws comparable. There is no comparison between peaceful prayer and the intimidation of 40daysforlife that has gone on at Bedford Square.